What a wonderful retreat! We enjoyed our stay very much and would defiantly return again. From the fabulous views to the perfectly decorated home interior we loved the entire experience. Thank you for sharing this little gem with us. It was even better than expected from the online photos! 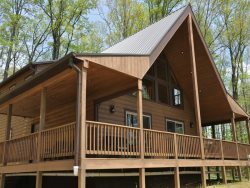 We thoroughly enjoyed our stay at your cabin. The views were breathtaking. Thank you so much.